Calabasas, CA, September 24, 2009 – Profiles in History, the world’s leading auctioneer of Hollywood memorabilia, will present an unprecedented collection of original screen-used visual effects creatures, armature and puppets, created by multiple Academy Award-winner Stan Winston. Numbering 85 lots, these items, which are expected to generate over $1,000,000 in cumulative sales, represent the most iconic characters ever created for film, including those from the Jurassic Park, Terminator and Predator film franchises, among others, and will be part of Profiles in History’s $5,000,000 Hollywood auction October 8-9, 2009. Each piece will be accompanied by a signed letter of authenticity from Stan Winston Studio. Worldwide bidding begins at 12:00 PM (noon) both days and can be placed either in person, via mail, phone, fax or live on the Internet at: http://www.icollector.com/Hollywood-Auction-37_a5736. Profiles In History is also pleased to announce the creation of the Stan Winston Visual Effects Scholarship at the University of Southern California (USC) Film School with the eventual creation of a Chair for Mr. Winston at USC to honor his life’s work and keep his legacy alive for generations to come. A portion of the proceeds from the sale of these items will go to fund the Stan Winston Scholarship. An original hero screen-used T-800 endoskeleton from T2 3-D: Battle Across Time ($80,000-$120,000), an original full-scale T-800 endoskeleton from Terminator 3: Rise of the Machines ($60,000-$80,000-please note-this was used for computer graphics reference for the making of Terminator 3. Unlike Terminator 2, which used full-scale endoskeleton puppets, there were no physical T-800 endoskeletons used in the production of T3), a screen-used Terminator T-800 complete costume and display from Terminator 2: Judgment Day, a 65 inches wide x 9 feet long x 77 inches tall screen-used T-1 battle-ready armored drone from Terminator 3: Rise of the Machines, a screen-used full-scale T-X “Terminatrix” endoskeleton from Terminator 3: Rise of the Machines, an imposing 9 ½ feet tall, full-size “Predator” display from Predator and Predator 2, a T-Rex maquette from Jurassic Park, a 120 inches long and 52 inches wide, a screen-used full-scale Spinosaur head from Jurassic Park III ($40,000-$60,000 EACH) and a full-scale male T-Rex head display from Jurassic Park ($30,000-$50,000), measuring an incredible 68 inches tall (on base) and 98 inches in length. 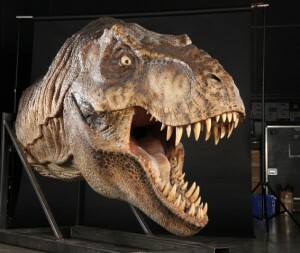 PAST Stan Winston Studio created items sold by Profiles in History have yielded astounding results, including a full-scale model T-800 Endoskeleton from Terminator 2: Judgment Day that sold for $488,750, a full-scale T-Rex head from Jurassic Park that sold for $126,500, a hydraulic screen-used Velociraptor from The Lost World: Jurassic Park II that sold for $115,000, a screen-used T-1 battle-ready armored drone from Terminator 3: Rise of the Machines which sold for $109,250 and a full body, screen-used Terminator (T-800 model with costume) from Terminator 3: Rise of the Machines that sold for $74,750. This entry was posted in Like Show Business and tagged auction, Stan Winston by Mike Glyer. Bookmark the permalink.